/ What is more important in your Virtual Team – Attitude or Ability? All I can say to start this article is “Watch out for the Red Flags”. When we recruit for our Virtual Team, we have a strict process, however the temptation is when you are desperate and need help immediately – to shortcut the process. This is dangerous…let me explain. Red Flags are what we call ‘warning signs’ in our recruitment process. It is when a person has not ticked one of the important boxes. Your requirements will be different depending on the role, however when looking at a potential virtual team member – how highly does attitude rank over ability? What is most important to you? Attitude is the most important quality we look for in our business. Skills are important, but a person with the right attitude, they can always be taught the needed skills. A person with a “stinking” attitude and all of the ability in the world will not help your business or your team. Let me share how me ignoring a red flag in this area cost me 2 years of wasted time in my business and thousands of dollars in training staff members. I have also seen lost money and time, countless times in the virtual teams of our customers due to this very same factor. It is when you hire a person with dazzling ability, I mean capable and learned, sharp – but they do not have the right attitude. What will happen is that you will actually start to shape your business around them; you will change your business to accommodate them because you think “this resource is too costly to lose”. Other team members will be called upon to accommodate their mistakes and lack of willingness to support the team. This will lead to lower team morale, frustration and just a general horrible feeling when you need something done. It will also make you lose motivation and you will start mismanaging the rest of your team. If you have this situation on your team right now, I want you to think back to when you recruited that person – I bet the attitude was a red flag, right? I bet you even discussed how this person might not be right but “hey we need someone and they seemed to have the right skills”. Am I correct? Please share below your experience. So my advice to you is – when you recruit for your Virtual Team, make one of the red flags Attitude. 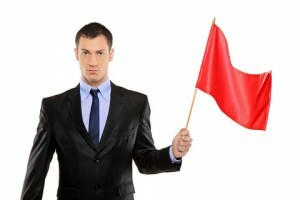 If a red flag is raised during the recruitment process – “RUN, as fast as you can in the opposite direction! J”. Do not submit to temptation. You will waste precious costly time trying to adjust their attitude when you could have spent that time up-skilling a person with a good attitude. I am not an employer.. yet. I value this information from a personal stand-point… in the physical world of recruitment. A virtual world is perhaps very different. I have worked with a few people who had great skill but a bad attitude… and from experience, this does indeed lower the moral of team members who are under a management that showed favouritism and not neglecting to address bad behaviour.